This is a review of the JBL MS8 DSP-integration unit. I have had this for a week and adjusted it a few times. Why did I buy it? I want to have my setup as stealthy as possible and retain the stock HU. The only other alternative for a combination electronic crossover, equalizer, time alignment is the Audison BitOne and the Alpine PXA700. I chose the MS-8 because of the auto correction and because you can set and forget. The BitOne does have the advantage of digital inputs which I could have used with addition aftermarket parts that convert the MB optical audio link to digital. Next upgrade! The price for the MS-8 was right also. Easy to install and setup. Menu structure is easy. Once you read thru the manual once to get the general idea you don’t have to open it again to repeat the setups. I liked the overall results but have a few reservations and suggestions for improvements. The unit has 4 parts: the main processor, microphone headset, wired remote display, and wireless remote. The remote display is used for all the setup and adjustment and can be removed once done, or left connected for balance, fading, tone controls, sub volume, EQ and processing on/off. It would be nice if they make these remote units wireless also, with maybe just a 12 volt in. 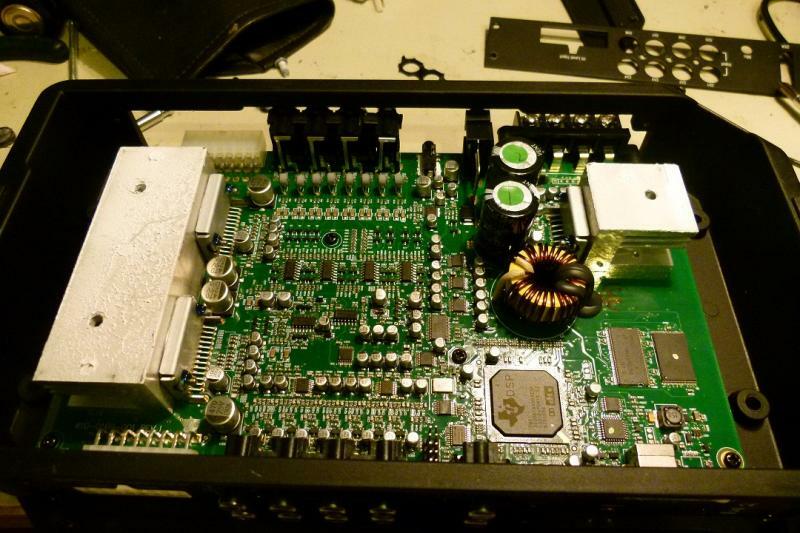 The MS-8 seem hefty and well built, with the top being the heat sink for the built in 8 channel power amp. However, it is very easy to break the rca input jacks if you bend the rca cables just a bit on install or have extra tight grounds and push too hard. Not sure what it was but was pushing on the cable to connect and I heard a crack. Sure enough the input was pushed inside so I had to open in up to epoxy things back together. 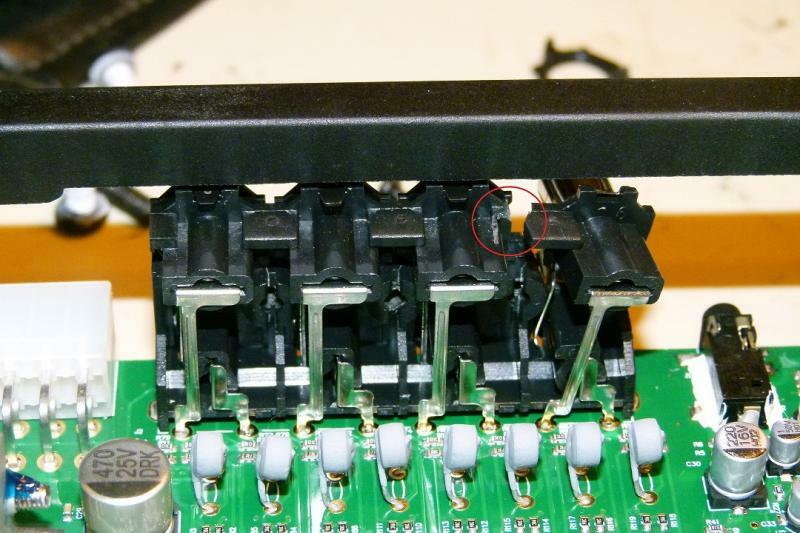 The inputs are held together with a few square mm of plastic. Cheap and easy to break. Shame! The 4 screw lugs for power, ground, remote in and out needs work too. The screws are rather short and it is easy to unscrew them completely when trying to connect larger wire, or my 3 remote wires twisted together. I gather they are intended for spade lugs and not bare wire. I should have put spade lugs. Call me lazy...I will let that pass, but poor marks for the cheap RCA inputs. Note the TI DSP Processor with DTS and Dolby Digital. Something for the future? The MS-8 has high level and low level inputs plus an aux input. A "calibration" CD is provided and you have to play it during input setups. I gather it will correct for OEM HU equalization. If you use high level inputs there is a setup for these. I did not go thru them since I have RCA outs. For low level RCA they want you to skip the input setup and connect the RCA left and rights directly to in inputs 1 and 2. I don't know what the CD is used for in this case. It is unclear then what rest of the 8 low level inputs are for. The next step is to tell the MS-8 what kind of speakers you have. It has 8 outputs usable for 1-2-3 way fronts, center, one way sides and rears plus 2 subs. But only 8 outputs max. So if you use 3 way fronts, you cannot use sides and rears! It is easy to set these up with different crossovers and slopes. I have it setup with 2 way fronts plus sides in the rear door, and 2 sub outs driving my 2 input sub amp connected to one sub. I probably could have connected the sub amp with only one output. If I ever and a center I will do that. If you really have a more elaborate system you can always use external active crossovers. Then you tell what the 8 outputs are, for example front left low frequency (mid bass), front left high frequency(tweeter) etc. Also very easy. I used only the low level outputs since I have enough amps for all speakers. There are also higher power outputs you can use to drive speakers directly. Great for a lower cost setup but the power out is not any better than from most head units. Why they did this I am not sure. Poor man's bi-amped setup? There is then an audio check for proper assignment of these outputs. Once that is done, you don the microphone headset and sit in all 4 seats and do the automatic audio adjustments. First set the remote to -20db output, You look forward, left mirror, right mirror in all 4 seats while it plays a series of sweep tones . Easy as pie. However, the entire issue of test level is not precise. They say to set the level so that the test tones are at a "normal conversation level" It would be nice to have some sort of test tone so you can set all levels properly first. Perhaps some white noise and level measurement to adjust sub, mid and tweeter amp gains. This all takes less than 10 minutes. One of the drawbacks is you the only way to change anything is to start all over. You cannot save input or output setups, or change crossover frequencies independently. It would be nice to be able to save these and then listen without having to do any of the automatic frequency response or time alignment. Or be able to tune tweeter positions and then just rerun the frequency/time alignment calibration without having to redo all of the input/output setup. Note that you can turn off all processing once it’s done, leaving only the input and output settings. Next problem: you don't get any information of what frequency response correction it has made, nor what time alignment it has done. For example, if you could view the equalization it has dialled in, you may be able to determine if your sub, mid or tweeter amp gain is not set correctly. Once this is done you can use the built in 31 octave equaliser, but you cannot adjust or view time alignments. There is also bass, mid and treble tone controls and front back fade and left right. You can also select the best sound for seating Driver, passenger, front, rear or All. It is unfortunate that you can only use two inputs. It would be great to be able to use front and back RCA inputs in order to continue to be able to control these from the HU. You can save several of these audio adjustments as favourites. You can also defeat the System 7 and turn off all correction. I don't have a center channel but I toggled the System 7 on and off. With it on the front stage seemed more solid, with it off, the sound seemed to come more from the sides. I will have to run my IASCA test CD to see if it has improved the sound stage. Overall I am glad I have it but the broken RCA leaves a bad taste. I will experiment with a few things and report back. Last edited by zoomer; 11-01-2011 at 08:30 PM. Great review. I have this unit too, and just got my summer car on the road. Still experimenting with this processor. I am gonna play more with different volumes on the unit. I have some sort of interference in my left front channel when bass hits hard. If I have the JBL volume set too close to 0, and every time bass hits, I get some weird booming blast coming from the left. I have it set up with high level inputs, so I wonder if the JBL gets too sensitive at that point and picks up loud noises. I tried setting it at -30 to -35, and now I wanna try it lower, so hopefully the sound will be good still and I would be able to play louder without getting too close to 0 on the volume. Other than that I am very happy with the auto settings. i usually set the volume at 25 20 for the autotune. works good so far. tryed louder and some resonance comes in and screws things up. I found the problem. I didn't unplug the mic, cause I thought it shouldn't cause an issue, but the right side stays open and picks up noises, and that's what I hear. I figured it out by putting my finger over the mic hole. Because the unit is stashed away, someone recommended I get a quality extension cable and leave it hanging until I am ready to plug the mic into it. Also, someone mentioned, that he lowered the gains on his amps, and got more volume out of everything. Perhaps worth a try too. But I think, what may be happening is a similar effect, as if you would calibrate at -40 or lower, cause that also causes the beeps to be more quiet, and perhaps that forces MS-8 to jack things up. I tried doing it at various volumes with gains equally set, and volumewise it appears to be the same, but I noticed that perhaps you get more mids that way. Where in the car do you keep the mic? Did you use hi-level input or the RCA's from head unit? Mine's hi-level. I see. Mine is in the trunk, and when the subs starts to drop heavy and loud, the mic picks it up. I noticed when inside the car, it is way better. i have my mic plugged in too. its in the trunk but hte sub fires into cabin. I will disconnect to see if there is any diff. I dont notice anything. Yeah the mic is something that needs to be unpluged. Quick Reply: JBL MS-8 review!